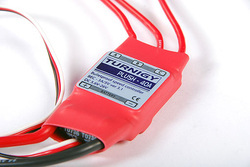 The big brother to the excellent Plush 30A Brushless ESC. Great for Planes or Heli's or Multicopters drawing up to 40Amps continuous. Rated for 55A bursts. Up to 3Amps at 5V for the BEC. 33 grams.